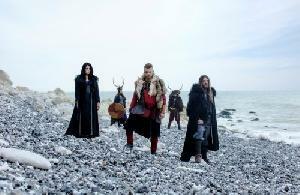 SKÁLD presents its debut album « Le Chant des Vikings » for the first time on stage. SKÁLD is inspired by Nordics mythology, and the long time concept came to fruition when a group of passionate people decided to collaborate: producer/composer Christophe Voisin-Boisvinet, and three singular and talented singers: Justine Galmiche, Pierrick Valence et Mattjö Haussy. Together, they have taken on the task to resurrect the ancient scalds poetry in its original language – the Old Norse – and to tell the history of the Viking people and their gods. SKÁLD takes the listener through a rich musical landscape full of imagery, using typical ancient instruments for the occasion: (shamanic drums, talharpa, jouhikko…), and unfolds the many faces of Scandinavian culture. SKÁLD will take you on a trip to unknown territories and faraway shores, you will be the witness to epic fights of axes and swords, you will find yourself dancing in the middle of Völurs – these priestesses who can see into the future, and end up riding through the Bifröst on the back of Odin’s horse to attend to the feast of the Nordic gods.